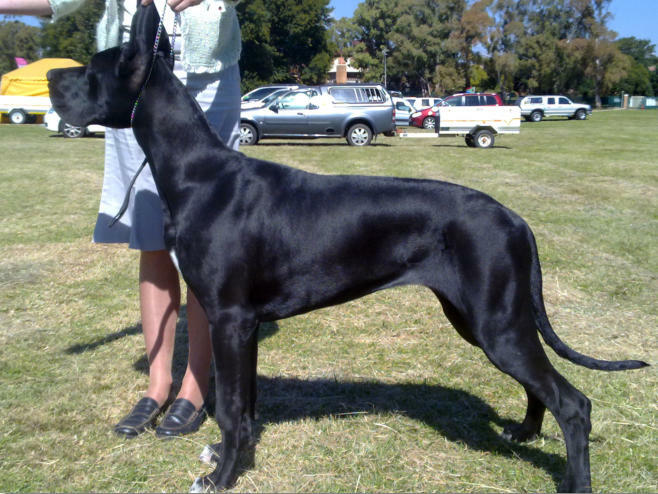 • Sire : Aaron von der Domaine Hohlenfels (Imported Germany) C1/C1 ED00 • Dam: Carlu Bet-Sua HD00 • Breeders: Carel & Lucille Breytenbach, Carlu Great Danes, Johannesburg, South Africa Despite being a veteran, Echo remains a lively Dane. She combines her dam's wonderful conformation with her sire's impressive head and substance. Unfortunately Echo was not shown as much as we had hoped due to other commitments. Echo was the dam of the 2002 Saxony I Litter (7 pups) and is now spayed.